Ramon Berenguer I, called the Old, was Count of Barcelona in 1035–1076. He promulgated the earliest versions of a code of Catalan law. Born in 1024, he succeeded his father, Berenguer Ramon I the Crooked in 1035 and it was during his reign that the dominant position of Barcelona among the other Catalan counties became evident. Ramon Berenguer campaigned against the Moors, extending his dominions as far west as Barbastro, historians claim that those tributes helped create the first wave of prosperity in Catalan history. During his reign Catalan maritime power started to be felt in the western Mediterranean, Ramon Berenguer the Old was the first count of Catalonia to acquire lands and influence north of the Pyrenees. Another major achievement of his was beginning the codification of Catalan law in the written Usatges of Barcelona which was to become the first full compilation of law in Western Europe. Legal codification was part of the efforts to forward and somehow control the process of feudalization which started during the reign of his weak father, Berenguer Ramon. Another major contributor was the Church acting through the institution of the Peace and Truce of God and this established a general truce among warring factions and lords in a given region for a given time. 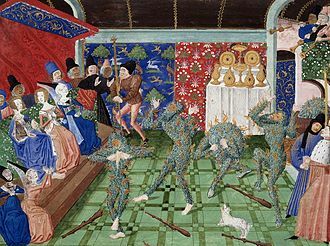 The earliest extant date for introducing the Truce of God in Western Europe is 1027 in Catalonia, while still married to his second wife Blanca, he became involved with the wife of the Count of Toulouse, Almodis de La Marche, countess of Limoges. Both quickly married and were excommunicated by Pope Victor II. Ramon Berenguer I, together with his third wife Almodis, founded the Romanesque cathedral of Barcelona and their velvet and brass bound wooden coffins are still displayed in the Gothic cathedral which eventually replaced the cathedral that they founded. He was succeeded by his twin sons Ramon Berenguer II and Berenguer Ramon II, bernard F. Reilly, The Contest of Christian and Muslim Spain, 1031-1157, Blackwell Publishing,1995. The status of her authority, Patricia Humphrey, Queens and Potentates, theresa M.
Baldwin III was King of Jerusalem from 1143 to 1163. He was the eldest son of Melisende and Fulk of Jerusalem and he became king while still a child, and was at first overshadowed by his mother Melisende, whom he eventually defeated in a civil war. During his reign Jerusalem became more closely allied with the Byzantine Empire, Baldwin captured the important Egyptian fortress of Ascalon, but had to deal with the increasing power of Nur ad-Din in Syria. He died childless and was succeeded by his brother Amalric, Baldwin III was born in 1130, during the reign of his maternal grandfather Baldwin II, one of the original crusaders. This made him the third generation to rule Jerusalem, Baldwins mother Princess Melisende was heiress to her father, Baldwin II King of Jerusalem. Baldwin IIIs father was Fulk of Anjou, the former Count of Anjou, King Baldwin II died at the age of 60 when his grandson was a year old, which led to a power struggle between Melisende and Fulk. Melisende asserted her right to rule as successor to her father, yet Baldwin showed little interest in the intricacies of governance. In the Muslim world, Zengi ruled northern Syria from the cities of Mosul and Aleppo, in 1144, Zengi captured Edessa, which shocked the Western world and led to the Second Crusade. This crusade did not reach Jerusalem until 1148, and in the meantime Zengi was assassinated in 1146 and he was succeeded by his son Nur ad-Din, who was just as eager to bring Damascus under his control. To counter this and Damascus had made an alliance for their mutual protection, Baldwin marched out from Jerusalem and attempted to capture the Muslim fortress Bosra, but Nur ad-Din arrived with his army and forced the Crusaders to withdraw. Later, Jerusalems truce with Damascus was restored, in 1148 the crusade finally arrived in Jerusalem, led by Louis VII of France, his wife Eleanor of Aquitaine, and Conrad III of Germany. Damascus was considered important in the history of Christianity than Aleppo. Baldwin agreed to the plan to attack Damascus, but the siege ended in defeat after only four days. The city fell under Nur ad-Dins control in 1154, and the loss of a Muslim counterweight to Nur ad-Din was a diplomatic disaster, by 1149 the crusaders had returned to Europe, leaving behind a weakened Jerusalem. Baldwin IV, called the Leper, reigned as King of Jerusalem from 1174 until his death. He was the son of Amalric I of Jerusalem and his first wife, Baldwins father died in 1174 and the boy was crowned at the age of 13, on 15 July that year. In his minority the kingdom was ruled by two regents, first Miles of Plancy, though unofficially, and Raymond III of Tripoli. In 1175, Raymond III, the king of Jerusalem. 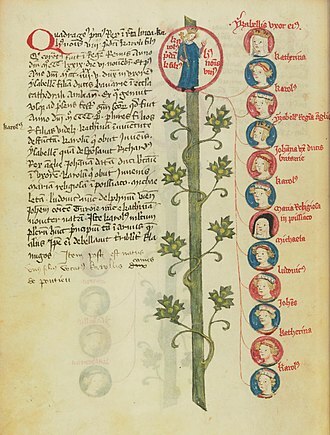 Sibylla was being raised by her great-aunt Ioveta in the convent of Bethany, while Isabella was at the court of her mother, Raymonds regency ended on the second anniversary of Baldwins coronation, the young king was now of age. He did not ratify Raymonds treaty with Saladin, but instead went raiding towards Damascus and he appointed his maternal uncle, Joscelin III, the titular count of Edessa, seneschal after he was ransomed. Joscelin was his closest male relative who did not have a claim to the throne, so he was judged a reliable supporter, William arrived in early October and became Count of Jaffa and Ascalon upon his marriage. In 1174, at the age of 13, Baldwin successfully attacked Damascus in order to draw the Muslim Sultan Saladin away from Aleppo. In 1176 he was leading men in the front in similar attacks at Damascus, Baldwin planned an attack on Saladins power-base in Egypt. He sent Raynald of Châtillon to Constantinople as envoy to Manuel I Comnenus, Raynald had recently been released from captivity in Aleppo, Manuel paid his ransom, since he was the stepfather of the Empress Maria of Antioch. Manuel sought the restoration of the Orthodox patriarchate in the kingdom, Reynald returned early in 1177, and was rewarded with marriage to Stephanie of Milly, a widowed heiress. 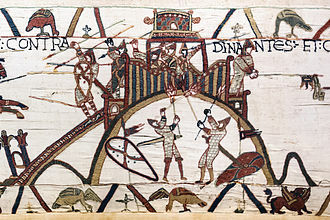 This made him lord of Kerak and Oultrejourdain, Baldwin tried to ensure that Reynald and William of Montferrat co-operated on the defence of the South. However, in June, William died at Ascalon after several weeks illness, in August the kings first cousin, Philip of Flanders, came to Jerusalem on crusade. Philip demanded to wed Baldwins sisters to his vassals, Philip, as Baldwins closest male kin on his paternal side, claimed authority superseding Raymonds regency. Alexios II Komnenos or Alexius II Comnenus was Byzantine emperor from 1180 to 1183. He was the son of Emperor Manuel I Komnenos and Maria, daughter of Raymond of Poitiers and he was the long-awaited male heir and was named Alexius as a fulfilment of the AIMA prophecy. On Manuels death in 1180, who became a nun under the name Xene and she excluded her young son from power, entrusting it instead to Alexios the prōtosebastos, who was popularly believed to be her lover. Their party was defeated on 2 May 1182, but Andronikos Komnenos and he entered Constantinople, received with almost divine honours, and overthrew the government. His arrival was celebrated by a massacre of 80,000 Latins in Constantinople, especially the Venetian merchants, which he made no attempt to stop. 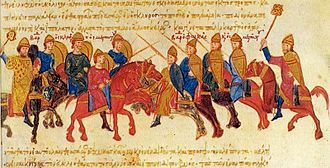 During the reign of Alexius II, the Byzantine Empire was invaded by King Béla III, losing Syrmia and Bosnia to the Kingdom of Hungary in 1181, even Dalmatia was lost to the Venetians. Kilij Arslan II invaded the empire in 1182, defeating the Byzantines at the Siege of Cotyaeum, resulting in the Empire losing Cotyaeum, Alexios is a character in the historical novel Agnes of France by Greek writer Kostas Kyriazis. Conrad, called the Younger or the Boy, but usually known by the diminutive Conradin, was the Duke of Swabia, King of Jerusalem, and King of Sicily. Conradin was born in Wolfstein, Bavaria, to Conrad IV of Germany and he is sometimes known as Conrad V of Germany. Though he never succeeded his father in Germany, he was recognized as king of the Germans, having lost his father in 1254, he grew up at the court of his uncle and guardian, Louis II, Duke of Upper Bavaria. 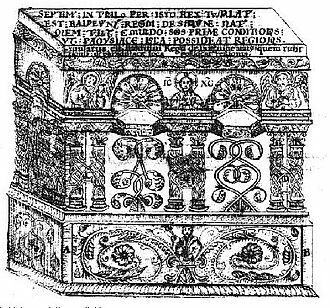 His guardians were able to hold Swabia for him, Jerusalem was held by a relative from the royal house of Cyprus as regent. In Sicily, his fathers half-brother Manfred continued as regent, little is known of his appearance and character except that he was beautiful as Absalom, and spoke good Latin. Innocents successor, Pope Alexander IV, continuing this policy, offered the Hohenstaufen lands in Germany to King Alfonso X of Castile and forbade Conradins election as king of the Romans. 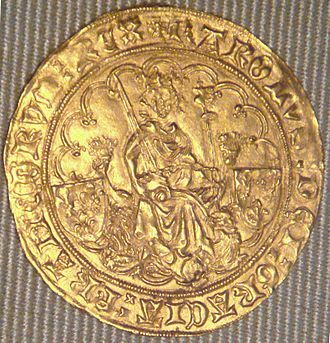 Having assumed the title of King of Jerusalem and Sicily, Conradin took possession of the Duchy of Swabia in 1262, and remained for some time in his duchy. Conradins first invitation to Italy came from the Guelphs of Florence, they asked him to arms against Manfred. Louis refused this invitation on his nephews behalf, count Guido de Montefeltro representing Henry of Castile, Senator of Rome, offered him the support of the eternal city. Pledging his lands, Conradin crossed the Alps and issued a manifesto at Verona setting forth his claim on Sicily. 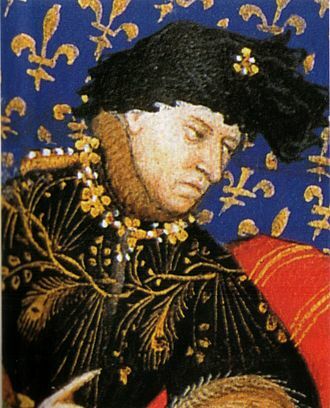 Notwithstanding the defection of his uncle Louis and of other companions who returned to Germany, the threats of Clement IV, only Palermo and Messina remained loyal to Charles. The revolt spread to Calabria and Apulia, in November of the same year the Church excommunicated him, but his fleet won a victory over that of Charles, and in July 1268, Conradin himself entered with immense enthusiasm in Rome. Having strengthened his forces, he marched towards Lucera to join the Saracen troops settled there since the time of his grandfather. On 23 August 1268 his multi-national army of Italian, Roman and German troops encountered that of Charles at Tagliacozzo and he was tried as a traitor, and on 29 October 1268 he and Frederick were beheaded. An-Nasir Muhammad was born and died in Cairo. He was the youngest son of Sultan Qalawun and the brother of Sultan Al-Ashraf Khalil and he was born in Cairo at Qalat al-Jabal. His mother was of Mongol origin, Al-Nasir Mohammad married Khawand Toghay, who started as his slave but was freed by him. She gave birth to Prince Anook and his reign was in three stages, as he was deposed twice during his reign. After the assassination of al-Ashraf Khalil in December 1293, he was installed as sultan with Zayn-ad-Din Kitbugha as the regent and vice-sultan, as an-Nasir was only 9-years-old, he was a sultan in name only. Kitbugha and al-Shujai were the rulers of Egypt. The two emirs, who was of Mongol origin, and al-Shujai were rivals and did not get on each other. The Ashrafiyah were defeated and many of them were killed and executed, Kitbugha deposed an-Nasir Muhammad and installed himself sultan with Lajin as his vice-sultan. An-Nasir, who was by now 10 years old, was removed with his mother to another section in the palace where they stayed until they were sent to Karak thus ending the first reign of an-Nasir Muhammad. In 1296 Kitbugha was deposed by his vice-Sultan Lajin and he fled to Syria, Lajin ruled as a sultan until he was murdered with his vice-sultan Mangu-Temur in 1299 by a group of Emirs led by Saif al-Din Kirji. But the recall of an-Nasir was delayed for some time as Emir Kirji, who murdered Lajin, at last, an-Nasir was recalled and he arrived with his mother in Cairo amid widespread celebration by its population. An-Nasir, who was by now 14 years old, was re-installed with Seif ad-Din Salar, An-Nasir was, again, a nominal Sultan, with the actual rulers being Salar and Baibars al-Jashnakir. The Burji Mamluks became more powerful during the reign of an-Nasir Muhammad. They imposed taxes on people who needed their services or their protection and this official bribery was called Himayah. The rivals of the Burjis, who were led by Baibars al-Jashnakir, were the Salihiyya, news reached Cairo that Ghazan was preparing to attack the Levant with a big army and about 30 Crusade ships arrived in Beirut. 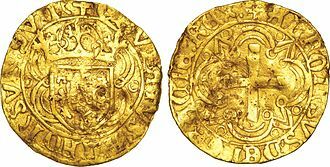 Ramon Berenguer I and his wife, Almodis de la Marche, counting out 2000 ounces of gold coins as payment to William Raymond and Adelaide, count and countess of Cerdagne, in return for their rights over Carcassonne in 1067. Sepulchers of Ramon Berenguer in the Cathedral of Barcelona.